Lytham & St.Annes on the Sea Lancashire - Local History - England Answers the Call - RFA Brigades at St.Annes and Lytham - Pathe 1915. England Answers the Call - RFA Brigades at St.Annes and Lytham - Pathe 1915. The fields were between Headroomgate Road and St.Patrick's Road and the rear of houses (above) are in Knowles Road. The large building to the far left is the Parish Rooms. Lord Derby inspecting RFA Brigades at St.Annes-on-Sea, and the 151st & 148th RFA Brigades on Lytham Green, 16 April 1915. St.Annes: Shot of several officers and Lord Derby in a bowler hat; walking on grounds; with large buildings in the background. Pan as they walk by rows of soldiers; stretching a long way down a big field; then pan back on the rows of soldiers.Some of the group of officers walking away from camera; with soldiers marching in the background. 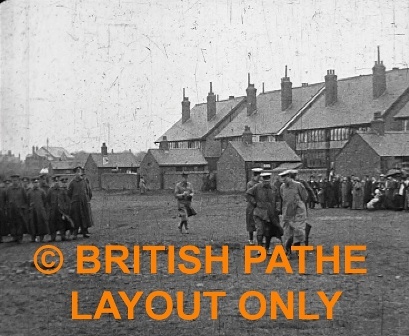 Lytham: Shot of the troops marching in lines toward camera; two of the officers stand watching and one salutes. Pan to the others watching. This is Lytham Green, opposite the Clifton Arms Hotel.